At midnight in the middle of a field in the Netherlands, two figures crouch over the ground. Flashlights slowly glide over the terrain as the duo search for stars. My brother and I went on a vacation together in Europe last month. We had a lot of fun adventures. We visited an amusement park in Italy. We slept above a pub in London and saw a Shakespeare play at the Globe Theatre. We walked through the pouring rain in Amsterdam in search of food. Good times. 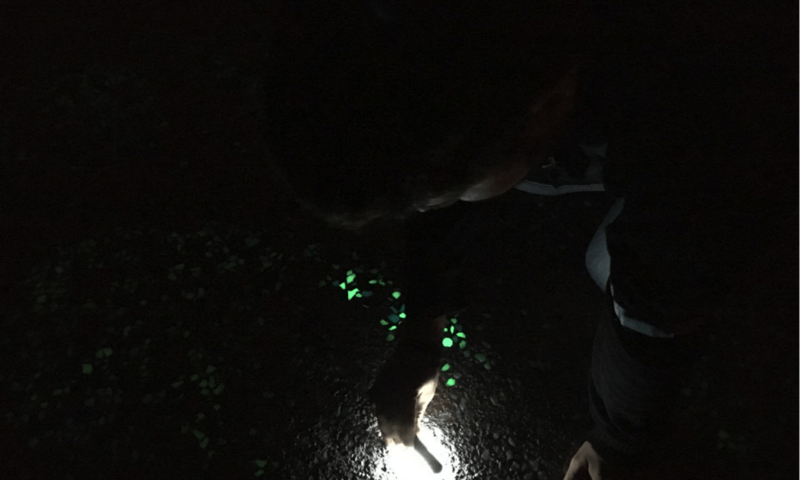 But the main goal of our trip, and probably the real reason we started this journey, was a glow-in-the-dark bike path in the Netherlands. Between the city of Eindhoven and the small town of Nuenen, rests the Van Gogh-Roosegaarde bicycle path. 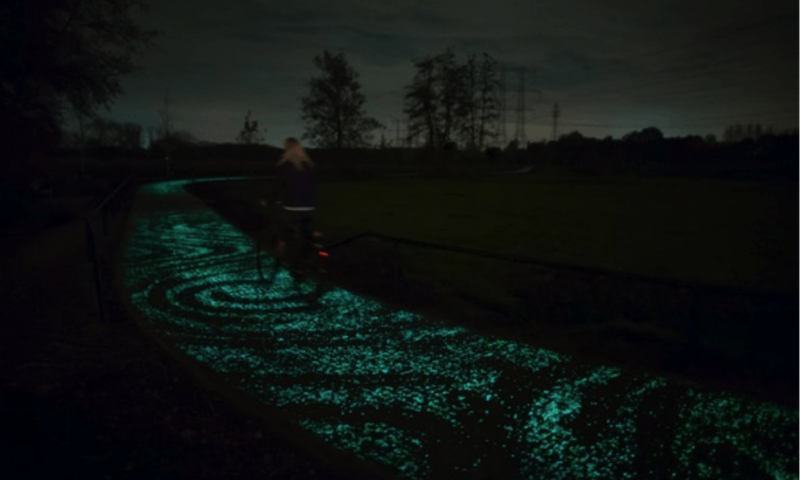 Created by Dutch designer Daan Roosegaarde back in 2014, the path’s glowing image is based on Van Gogh’s The Starry Night. We had learned about this quirky artistic project through Facebook last year and had felt inspired enough to see it in person. The path cuts across a field, connecting a busy intersection with a quiet residential neighborhood. We arrived at the intersection around 11 pm, turned off our bicycle lights, and slowly pedaled into the darkness. The lights and sounds of traffic died away and we found ourselves sailing over dark concrete. We followed the river of darkness – watching the path. A blip of light. Another. Yet another. And suddenly we were flying above swirls of light – a moving galaxy of stars and imagination. Darkness again. Then more light. The path seems to have degraded over time. Each curve still contains a photaic symphony of light and art. We rode over the path, start to finish, several times. Most of the day had been overcast – so the path wasn’t very bright. A bit of a letdown actually. I mean, don’t get me wrong. We’re all for sustainability and solar energy – but we had traveled hundreds of miles to see this thing and we wanted a bigger light show. So we whipped out a flashlight and our iPhones to “charge up” the path. We actually managed to coax some life into the luminescent pieces. We huddled against the ground, shining lights close to the pavement, slowly re-kindling the stars beneath us. Almost got run over by cyclists in the process. Scared a cat. Made friends with a dog out for a walk with his owners. I’m not entirely sure if we weirded out the people who passed us. I wouldn’t be surprised if they get a lot of American tourists with flashlights out in the middle of nowhere. Our efforts were admirable – and fun – but we were only able to light up a small part of our night. We eventually gave up, rode the path one last time, and headed back to bed. In some respects, the evening was a bit of a downer. Weather and time had reduced a fully-illuminated path to patches of dim light, but we agreed that it was still a cool experience. Clouds and city lights had blocked the sky above us, but we still found a night of glowing stars at our feet. We are considering a sequel to our European adventures. We might cycle from Amsterdam all the way down to the Van Gogh bike path. We’ll probably bring a UV flashlight too – our version of a twenty-first-century paintbrush. Bicycles need to be returned before closing time. You can keep the bicycle overnight if you ask first. It will count as an additional day. Some hostels in the area offer bike rentals, sometimes for free. A small museum dedicated to Vincent Van Gogh and his time in Nuenen. Audio guide for multiple languages, cafè, and gift shop (with maps). Tasty ice cream at the cafè across the street – good after a lot of cycling. Famous Van Gogh painting. You can find the watermill outside Nuenen. Featured in various Van Gogh paintings. Also outside Nuenen. Apparently this place is an active mill and sells flour, but we only stopped to see it. Dan Blair is an American living and working in Italy. He likes good food, making movies, and cycling around in the middle of nowhere.